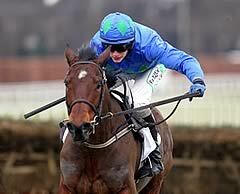 The brilliant Hurricane Fly became the only horse other than Comedy Of Errors to regain the Stan James Champion Hurdle when storming up the Cheltenham hill to score by two and a half lengths under Ruby Walsh. The nine-year-old, who finished third in last year's race after winning in 2011, did not look to be travelling well in the early stages. "It's brilliant. I can't say I was ever overly confident - I've been confident for the past three weeks - but from the word go he was never travelling like he can do and he made a few mistakes. They were going a bit quick for me," admitted Walsh. "Because I was never travelling, I probably got there two furlongs too soon but he pinged the last and ground it out to the line. 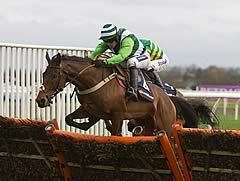 He is a cracking horse and I'm pleased he got it back because he is a true champion hurdler. "When Grandouet fell, I went up where he had been and we got going again. I had it in my head to commit after the bend and that's what I did. "Credit to the lads at home. 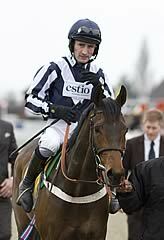 Paul Townend rides him and Willie (Mullins) had him spot on. I only steer him on the track, they do all the work. "He didn't spark last year when he lost his title and people can knock the horse all they like but this is his 15th Grade One victory and he's come back again. I don't see why he couldn't come back here and be competitive next year as 10-year-old. We have good prize for the hurdles in Ireland, which is why we don't come over here more often. "We knew we were in a better place with him this year and I could sense from Willie (Mullins) that he was happier with the horse." Rock On Ruby's trainer Harry Fry was magnanimous in defeat after last year's winner went down by two and a half lengths in the Stan James Champion Hurdle, calling Willie Mullins' gelding a 'true champion'. The 11/2 third-favourite tried to make every post a winning one from the outset and had every horse beaten bar the eventual winner as the field turned for home. As Hurricane Fly took up the running heading to the last, Rock On Ruby was briefly pressed for second place by Countrywide Flame but saw off the challenge of that particular rival to claim the runner-up spot by a length and a quarter. "I'm delighted with his run but he's been beaten by a true champion," said Fry. "He's run an absolute blinder. He's served it up to the field but in the end the better horse prevailed. I walked the course with Noel (Fehily) this morning and I've never seen him so positive. We agreed that we'd try and make all and the blinkers have worked a treat. "All credit to the Willie Mullins team for bringing Hurricane Fly back to regain his crown - we did all we could do to beat him but it wasn't good enough. "He's very unlikely to head to Aintree for the two and a half mile hurdle but we could look at running him again somewhere else before the end of the season." Countrywide Flame battled on strongly to finish third at odds of 16/1 and trainer John Quinn could not have been happier with his five-year-old. "He's run a great race and seems to be progressing nicely. It was some Champion Hurdle with three Champion Hurdle winners in there as well as two Triumph Hurdle winners so we're very happy to finish third," said Quinn. "He never seems to know when he's beaten and I think a return to this track suited him. I've often thought he's a lot better going left-handed and we'll probably keep him to these sort of courses - though I'd be tempted to try him again right-handed in the Cesarewitch later on this year! "The stats are against five-year-olds in this race but he wasn't beaten too far and we'll definitely be back for another crack next year all being well. In the meantime, he'll probably head to Liverpool for the Aintree Hurdle before a campaign on the Flat which will probably include the Chester Cup as well as the Cesarewitch." The Champion Hurdle was inaugurated in 1927, with the winner receiving £365. The race was abandoned in 1931 due to persistent frost, in 1943 and 1944 because of the Second World War, and in 2001 through the foot and mouth epidemic. There have only been three sponsors of this great race since its inception. Waterford Crystal backed the contest from 1978 to 1990, while the Smurfit Group sponsored the race from 1991 to 2010 and Stan James took over in 2011. The prize fund is a record £400,000 in 2013, up by £30,000 from the 2012 level. The biggest field has been 24 (1964 and 1991), and the smallest three (1932). The first five runnings of the race saw a total of only 24 runners between them. The current safety limit is 28. 1954), Persian War (1968, 1969, 1970), See You Then (1985, 1986, 1987) and Istabraq (1998, 1999, 2000). Eight horses have recorded two victories - Insurance (1932 & 1933), National Spirit (1947 & 1948), Bula (1971 & 1972), Comedy Of Errors (1973 & 1975 - the only horse to regain the Champion Hurdle), Night Nurse (1976 & 1977), Monksfield (1978 & 1979), Sea Pigeon (1980 & 1981) and Hardy Eustace (2004 & 2005). The most successful owners have been Dorothy Paget, who won the race four times thanks to Insurance (1932, 1933), Solford (1940) and Distel (1946), and J P McManus, who owned triple winner Istabraq (1998, 1999 and 2000) and Binocular (2010). Peter Easterby and Nicky Henderson are the most successful trainers, with five wins each. Easterby’s victories came courtesy of Saucy Kit (1967), Night Nurse (1976 and 1977) and Sea Pigeon (1980 and 1981). Nicky Henderson has enjoyed five successes so far through See You Then (1985, 1986 and 1987), Punjabi (2009) and Binocular (2010). Among jockeys, Tim Molony won most often, with his four victories coming on Hatton’s Grace (1951) and Sir Ken (1952, 1953 & 1954). A P (Tony) McCoy is the most successful current jockey with three wins - Make A Stand (1997), Brave Inca (2006) and Binocular (2010). Three mares have been successful - African Sister (1939), Dawn Run (1984) and Flakey Dove (1994). The biggest shocks in the Champion Hurdle were provided by Kirriemuir (1965) and Beech Road (1989), who were both returned at 50/1. At the other end of the odds scale, the shortest-priced winners were Lion Courage (1935), Sir Ken (1954) and Istabraq (1999), who were all 4/9 chances. In the 82 runnings of the Champion Hurdle, a total of 33 favourites (just over 40 per cent) have prevailed. Four greys have won, the most recent being Rooster Booster in 2003. The others were Kribensis in 1990, Our Hope in 1938 and Victor Norman in 1936, while one roan horse, Anzio (1962), has also been successful. The oldest winners were Hatton’s Grace (1951) and Sea Pigeon (1981), both 11-year-olds. Istabraq’s success in 2000 in a time of 3 minutes 48.1 seconds beat the previous Champion Hurdle record time, set by Make A Stand in 1997, of 3 minutes 48.4 seconds. Four winning jockeys of the championship event went on train the Champion Hurdle winner as well, led by Fred Winter, who partnered Clair Soleil (1955), Fare Time (1959) and Eborneezer (1961) to victory and then enjoyed four successes as a trainer - Bula (1971 & 1972), Lanzarote (1974) and Celtic Shot (1988). Ireland (18): Distel (1946), Hatton’s Grace (1949, 1950, 1951), Another Flash (1960), Winning Fair (1963), Monksfield (1978, 1979), For Auction (1982), Dawn Run (1984), Istabraq (1998, 1999, 2000), Hardy Eustace (2004, 2005), Brave Inca (2006), Sublimity (2007) and Hurricane Fly (2011).